The puff pastry crust and ricotta filling distinguish this tart from an ordinary quiche. Torta Pascualina is traditionally served during Lent, but it makes an excellent lunch or supper any time of year. You can also use empanada dough as the pastry layers, or this recipe for pastel tart dough. Sauté onion and garlic in the butter until soft and slightly golden. Add salt and nutmeg. Add mushrooms and sauté for 3-5 minutes more. Add spinach and cook for one minute. Remove from heat and let cool. Mix ricotta, mozzarella, parmesan and 2 eggs in a large bowl. Add cooled spinach mixture to the cheeses. Season with salt and pepper to taste. Roll out one of the pastry sheets in a circle about 14 inches in diameter (or roll out half of the empanada dough or pastel pastry in the same way). Drape pastry over a buttered 9-inch tart pan with a removable bottom, pressing pastry into bottom and sides of the pan. 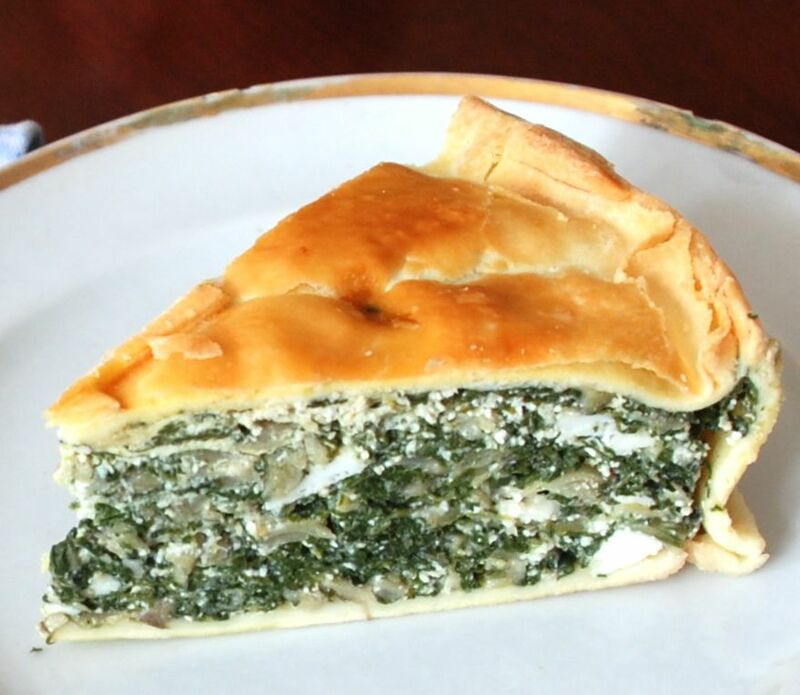 Fill tart with spinach/cheese mixture. Cut the hard-boiled eggs in half. Press them into filling, spacing them evenly. Roll out other piece of puff pastry (or other half of the empanada dough) into a 9-inch circle, and place on top of the tart. Seal edges together and crimp with a fork. Brush tart with the egg wash. Use a fork to prick a few holes in the top of the tart as vents. Place tart in the oven, lower temperature to 350 degrees, and bake for one hour. If tart is browning too quickly, you can cover the tart with foil loosely. Cool in pan for 30 minutes before lifting tart (with the removable bottom) out of the tart pan.